Tucked into a cul de sac in Alta Loma is a Spanish style, one story family home that is unique and yet common. For the secret of this 2400 square foot home is that despite its tract house appearance the owners have taken inexpensive steps to make it one of the most energy efficient homes in Southern California with a gas bill that seldom goes above $300 a year and an electric bill that is just a tad over $400 a year and that includes charging the Prius Plug-In nightly. Let’s start with the facts. First, the house is essentially all electric except for the gas dryer, water heater, and furnace. The back of the house has a southern exposure and is largely glass with a fairly large roof overhang. There is an oversized three car garage attached and the roof has three distinct pitches providing the interior with very high ceilings. Into this mix add a normal sized family, two large dogs, and the usual array of appliances and you have a very typical ranch style residence. Now comes the interesting part the average gas bill is about ten dollars a month. On extremely cold months this could rise to $35, but the dual pane windows let in an abundance of southern sunlight that heats the tile floor and helps keep the home comfortable long into the night. The addition of the newer windows and doors greatly helps in keeping energy costs down. Southern California Gas and Edison both offer rebates in some cases. During the warmer summer months the roof overhang keeps the sun from shinning into the house. Helping keep the stucco exterior cool is the placement of large bushes on the southside of the house. The large attic acts to “store” the rising heat from the living areas and together make running the air conditioner a rare event. Indeed, last year it was only on twice and this year three times. 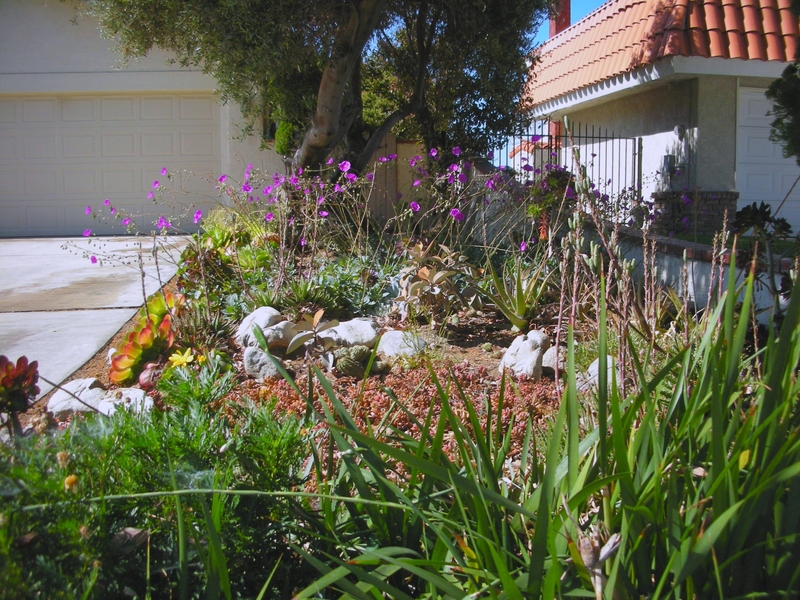 The water bill was reduced by the use of drought tolerant plants which require little maintenance, very little care, and no fertilizer. A drip system was installed, but even in hot weather watering twice a week is all that is needed. A grant to remove the grass front yard was given by the area water agency. Although some people hire professional landscapers, the yard was designed by the homeowner to reflect their desire to have a colorful, happy yard. 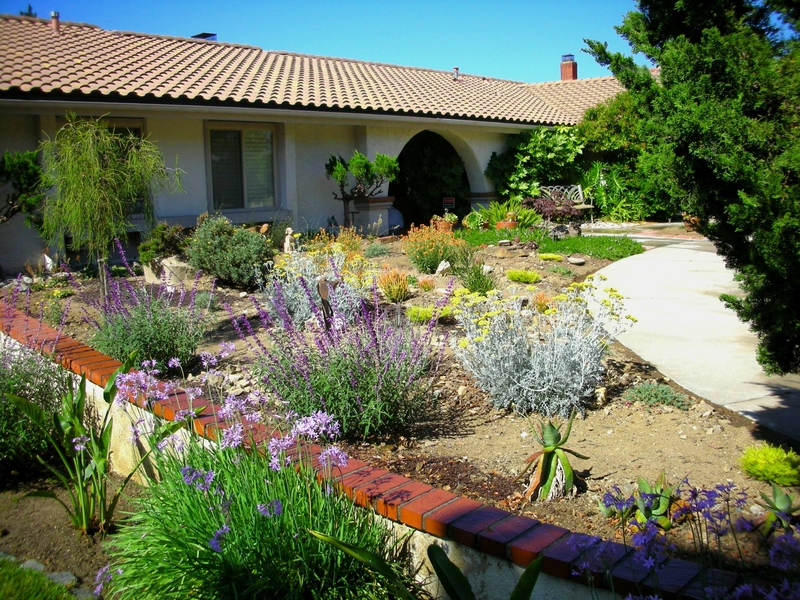 Citrus trees on the property and a garden add to the water cost, but the drought tolerant landscaping has partially offset this and resulted in substantial savings. In addition, the home has low water use toilets and washing machine. The showers have restrictive flow features and the dish washer is never started unless it is full. The gas bill was dramatically reduced with the tankless water heater and a two-stage furnace. Helping reduce the need for heating are ceiling fans that bring down the warmer air from the high ceiling in the house. Changing the directions of the fans in summer also helps to increase evaporation and keeps the family cooler. Energy efficient fans only cost about three tenths of one cent per hour to operate. Electricity rates were also kept low by taking advantage of Southern California Edison’s savings plans and the installation of an upgraded SEER air-conditioner. Energy Star appliances, the use of outlet strips that can be shut off ending parasitic losses to devises that are plugged into them, and having lighting systems that use less electricity all squeeze the energy costs. Another important saver is programing the dishwater and clothes dryer to run during late hours. Interestingly, the Prius Plug-in, has a timer that enables it to start charging during off-peak hours. The addition of the Prius has raised the monthly bill for electricity by a measly $4. There are other things that can reduce energy use that may take more time. For example, having large bushes and trees keep the sun off the house is worthwhile. The west side of the Alta Loma house is shaded by a hedge and vine. Keeping your freezer and refrigerator full and keeping the coils clean helps save running costs and using small solar entry lights can keep your entry lighted for very little cost. One final tip, on those cold nights when the thought of going to bed unless the home is 68 or higher degrees, is not appealing, use the microwave to prepare a couple of rice heating bags. They can be tucked under the covers a few minutes before bedtime and they can easily take the chill off the bedding and retain warmth for over an hour. Setting the programmable thermostat at 62 at night and 68 in the day in winter and a maximum in summer of 78 or 80, taking advantage of utility offerings checking your usage with an Edison account are ways you can certainly save yourself some hard earned income as well as help to save the environment. The bottom line is that this house does not use solar panels because it is so energy efficient it does not qualify. It just uses items that are subsidized by many energy agencies and water districts. The energy costs of this house would save a potential buyer thousands of dollars a year so those looking to purchase a home should definitely check the utility costs before making a decision. One sure fire way to get students interested and involved is through using lessons and issues related to the environment and animal rights. I started a 527 Wildlife Club. 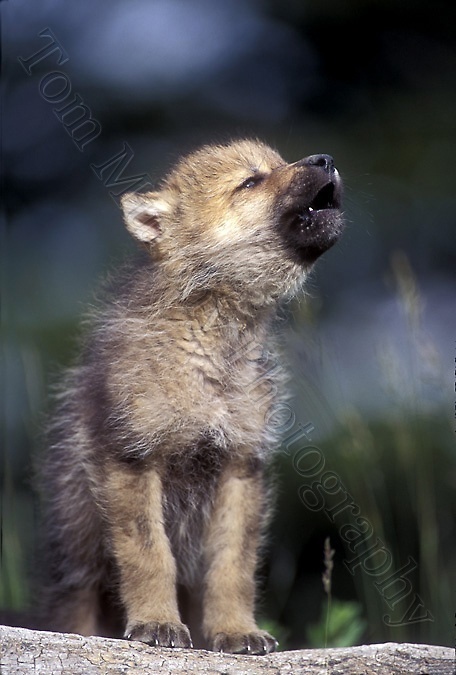 It was named for the dominate female Yellowstone female wolf that was killed by Ryan Counts of Pray, Montana. The wolf was wearing a radio collar and shortly thereafter most of her group was also killed. This an major kills in Idaho were the result of the gray wolf being removed from the endangered list by the Secretary of the Interior. After reading the story of 527’s life the students were eager to take action. They wrote letters, send petitions, sponsored a wolf at the Wolf Mountain Sanctuary, and sent money to Defenders of Wildlife. They were empowering themselves. They were motivated to learn and to use the system appropriately. When they came to class the regular lessons were waiting and they gulped down the material eagerly after checking what was happening on the current events board and what emails have arrived. This motivation not only rolled into the classroom, but they started to get their parents involved. Clearly, this issue was controversial as many feel that the wolves threaten their livestock and some claim wolves are causing the elk population to fall. Thus it is important to show both sides of the issue. That being said, there are less controversial issues students can adopt, but this issue and the way that 527 was killed stirred a fire under them as few other issues have ever done. Using the teachable moment ideas here, ( http://www.reacheverychild.com/feature/teachable-moments.html) I was able to integrate the curriculum, and keep the fires burning while still following the required course of study. Should you want to see more about what happened here are some articles that may be of interest. Also listed are a variety of environmental links to all types of educational related sites. Very worthwhile and true to the goal of education, which is to provide lifelong learners and good citizens. We even used them to bring in guest speakers to help bring new information to the students. Here is the site where we adopted a wolf from. There are other wolf adoption sites that may be closer. The Truth About Oil Drilling and Speculation? Comments Off on The Truth About Oil Drilling and Speculation? GAS PRICES – THE FACTS!!! – More Drilling: Domestic drilling has not led to lower prices. Since 2000, drilling has increased dramatically – climbing about 66 percent– while gas prices continue to increase. and gas companies have shown that they cannot keep pace with the rate of drilling permits that the federal government is handing out – over the past 4 years they have received and are sitting on nearly 10,000 permits that they aren’t using to increase domestic production. Since 1999, drilling permits for oil and gas development on public lands increased more than 361 percent. – OCS: The vast majority of federal oil and gas resources located on the OCS are already open for development – of all the oil and gas believed to exist on the OCS, nearly 80% of oil and 82% of natural gas is located in areas already open for leasing. In 2006, the federal government opened 8.3 million new acres in the Gulf of Mexico to drilling, yet gasoline prices have increased by $1.69 per gallon. Only 10.5 million of the 44 million leased offshore acres are actually producing oil or gas. – Open ANWR: EIA estimates that if we open ANWR today, twenty years down the road, at peak production, gas prices would be lowered at the maximum by $1.44 per barrel, which translates to only a few cents a gallon. Increased conservation and the use of alternative technologies in the last three years have cut the projected need for imported oil between now and 2050 by more than 100 billion barrels (EIA) – ten times more benefit than what we might be able to get a decade from now from ANWR. – More Refineries: We have excess refining capacity. Last week, our refineries were running at 89% capacity – well below the 95-98% capacity use rates we’ve seen this time of year for the last decade. Republicans argue that environmental regulations are preventing new refineries from being built in the U.S. From 1975 to 2000, the U.S. Environmental Protection Agency (EPA) received only one permit request for a new refinery, which was approved. In addition, oil companies are regularly applying for – and receiving – permits to modify and expand their existing refineries. – Approved the Gas Price Relief for Consumers Act (H.R. 6074) to hold the OPEC monopoly accountable for price fixing that flouts the free market and artificially drives up the cost of crude oil. – Passed the Federal Price Gouging Prevention Act (H.R. 1252) to investigate price gouging by retailers who may be using the cover of high prices to unfairly inflate their rates even further. – Enacted the landmark Energy Independence and Security Act (H.R. 6) that raised vehicle fuel efficiency for the first time in 32 years and increased the renewable fuels standard. – Passed the Renewable Energy and Energy Conservation Act (H.R. 5351) to end unnecessary subsidies to oil companies making record profits and invest in clean, renewable energy and energy efficiency. – Approved the Renewable Energy and Job Creation Act (H.R. 6049) to renew and expand tax incentives for renewable energy. – Passed the Food and Energy Security Act (H.R. 2419) that promotes the development of biofuels, including those from non-corn sources. – We are continuing to talk with Committees about further possible action. THE HOUSING BUBBLE WAS CAUSED THE SAME WAY!! Now banks need bankruptcy protections! Deciding between food or gas? The winners in our global wealth redistribution these past 8 years are enjoying $200 hamburgers. Fine! More offshore drilling. THERE ISNT EVEN ENOUGH SHIPS TO GET THE DAMN OIL! This is an very interesting table about where all of the presidential candidates stand on energy usage. It is going to be updated and can be printed as a file. What is especially interesting is that Rudy Giuliani has no stated positions at present. It is good to be the poll leader. Ron Paul also has stated very little, except it does not like restrictions. Of note is the fact that almost every Republican doesn’t want to do anything about energy conservation while the Democrats are trying to outdo each other with restrictions. A huge list of links to sites that debate the pro and con of global warmings. Geography is an excellent way to integrate lessons in many subject areas. The Where and Why of geography and its five guiding principles make it an ideal way to start even the youngest student on his or her way to understand the environment. As well, geography is a staple of current events in the form of weather reports, global warming articles, or even news of highway and street construction as well as the cultural implications it offers in a global world.